many areas of the world. it makes up almost half of all lobster consumed. the word "lobster" in their names, the term "Lobster"
with about 28% of the Lobster market. and squat lobsters, which are relatively rare. 1. Homarus americanus, The most eaten Lobster in the world. 2. Nephrops norvegicus. The second most consumed type of Lobster. When you order a Lobster here in St. Maarten and throughout most of the Caribbean, this is what you'll get, The Caribbean Spiny Lobster, Panulirus argus. 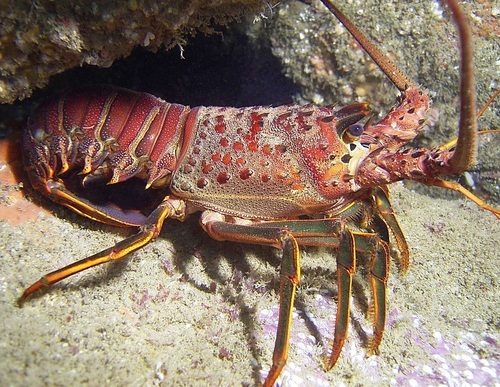 Although it is called a Lobster, the Spiny Lobster is not considered to be a "true" lobster, as it lacks the requisite claws. It also has two large spines that form forward-pointing "horns" above the eye stalks and second pair of large antennae that are longer than the body, and covered with forward pointing spines. and pancreas, It becomes noticeable once the lobster has been cooked and the tail has been removed because it turns green. Tomalley is considered to be a delicacy, and is a salty, sweet paste that adds extra concentrated lobster taste to whatever you add it to. In addition to being eaten alone on bread, it is also added to soups, stews, pastas, and sauces. The word "Tomalley" is thought to be taken from from the Carib word tumale, meaning lobster liver sauce.